Emerging 60 million years ago, the first horse was called Eohippus (The Dawn Horse) and was tiny, weighing only 12 pounds and standing just 14 inches high. In contrast to the modern one-toed horse, the Eohippus had four toes on its front feet and three on its hind feet. The term “horse” is derived from the Old English hors, which is related to the Proto-Indo-European (PIE) kurs, which is the source of the Latin currere, “to run.” This replaced the original PIE root ekwo from which the Greek hippos and Latin equus derived, both meaning “horse.” This dual etymology is perhaps due to the reluctance of ancient cultures to utter the actual root or name of an animal held sacred for the Indo-European religion. No horses existed in Australia until settlers brought them during the eighteenth century, and no early horse fossils have ever been found in Australia. Before being domesticated in the Middle and Far East around 4000 B.C., horses were hunted for their skin and meat, usually by being clubbed or driven over a cliff. After horses became domesticated around 4000 B.C., many Indo-European cultures regarded horses as a supreme sacrifice to their gods and often ritually entombed horses. People in the Caucasus practiced horse sacrifice as late as the 1800s. Famous owner/horse partnerships that helped change world history include Alexander the Great and his horse Bucephalus (“ox head”), El Cid and Babieca (“stupid”), and Napoleon and Marengo (named after a battle) who after its death, had its skeleton displayed in London. Though most horses live for 25-30 years, the oldest horse on record is “Old Billy,” who was a barge horse born in England and lived to the age of 62. The first year of a horse’s life is roughly comparable to 12 human years, the second year is comparable to 7 human years, the next 3 years are comparable to 4 human years a piece, and subsequent years are comparable 2.5 human years. That means Old Billy was roughly 173.5 horse years. The eyes of a horse are larger than most other animals', and they can move independently, giving the horse a shallow panoramic vision. Because its lenses are inflexible, a horse will focus on an image by moving its head to direct light rays to the central part of the retina. Horses can also see in color. A horse has an acute sense of smell that allows it to detect nervousness in a handler, and old-time horsemen would smear aromatic fluid on their hands when dealing with a difficult horse. Horses also become nervous around the smell of blood. Persians were excellent horsemen and their dominance in the east was largely due to the Nisean horse, the “superhorse” of antiquity. The horse was a status symbol in the Persian Empire, and only aristocrats could own them. Horses were also used to play early forms of polo. Islam is said to have been “founded on the hoof prints of the Arabian horse,”b and horse care was even incorporated into the sacred Hadith. The Prophet Mohammed is reportedly to have ascended to heaven in a halo of fire on a horse-like creature. 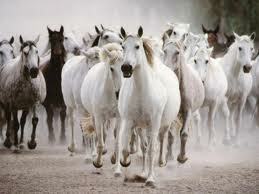 White horses were sometimes drowned in honor of Poseidon, the god of the sea and creator of horses. The Hindus associate the horse with the cosmos, and a white horse was considered the last incarnation of Vishnu. In literature, art, and dream theory, the horse is often a symbol imbued with various meanings, ranging from power to beauty and even sexual prowess. The coloring of a horse is also often symbolic (black: mystery, danger; white: messenger of birth), and the Bible specifically lists the colors of the Four Horsemen of the Apocalypse (White, Red, Black, and Pale). Some horses are able to figure out how to undo the doors of other horses and let them out. Horses can differentiate between emotions in the human voice. Horses experience two kinds of sleep, SWS (short wave sleep) and REM (rapid eye movement), and they most likely dream. They need about four hours of sleep out of every 24 and can sleep standing up by a special arrangement of locking joints. Horses like music but are selective in their taste. They prefer calming or cheerful instrumental music, but are agitated by loud music such as rock. A horse’s hoof is extremely complex and sensitive. When a horse puts pressure on its hoof, the blood is squeezed up the leg into the veins, thus acting as a type of pump. While the mare primarily cares for her newborn, occasionally a sibling, the sire, or other mares will shelter and protect youngsters. In a herd, one gender is not always dominant of another; for example, a female may rank higher than a male in some cases, and a male may rank higher than a female in other cases. Horses have a strong band of muscles around their esophagus. This band is so strong that a horse’s stomach would typically burst before it would vomit. The Pony Express (1860-1861) didn’t just use ponies; it also used many horses. The differences between ponies and horses are often blurred, but generally, ponies are smaller than horses and can be smarter and more stubborn. Though the word “hippopotamus” means “river horse,” a hippo is actually more closely related to the pig than the horse. There are many crazy horse laws, including one in Bluff, Utah, where an unmarried woman could be jailed for riding a horse on Sunday. And in several cities throughout the United States, newly married men were not allowed to ride alone, unless he had been married longer than 12 months.